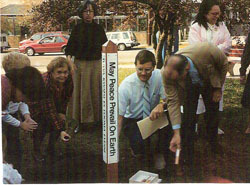 To serve as a lasting and visible symbol of the community’s aspiration and commitment to peace in the community and throughout the word, in 1989 the Oxford Peace Breakfast Network, which included Oxford Citizens for Peace and Justice dedicated a Peace Pole to the community. The plaques read, “May there be peace on earth” in four languages: English, Hebrew, Arabic, and Hopi (the only Native language available at the time). It was installed in front of the Oxford Municipal Building. At the time, 68,000 peace poles had been planted internationally. Today, Peace Poles are the most recognized international peace symbol and monument the world over. Oxford Citizens for Peace and Justice presented this peace pole as a gift to the people of Oxford to honor the diversity of the community and to strengthen our commitment to peace and justice. The new pole features the language of the Miami people, Chinese, Spanish, Swahili, Russian, Hebrew, Arabic, and English, as well as a small brass plaque in English Braille. We gifted the new and necessarily taller pole to the Oxford community in October 2013, and with the assistance of city staff, it was planted closer to the sidewalk for better visibility and access. We formally dedicated the pole April 26, 2014 as part of Earthfest celebration. Our original pole stood for 25 years, and 25 years later the search for peace is as essential as ever. Recognizing and understanding the diversity of people and cultures is crucial to that endeavor. The Peace Pole Project began in Japan in 1955 in response to the destruction from the bombings on Hiroshima and Nagasaki during the 2nd World War. 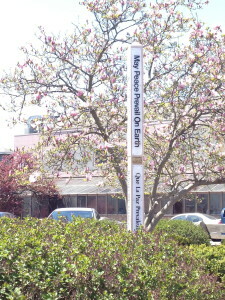 In 1986, the International Year of Peace, the peace pole project moved to the US. Japan, the only nation on earth to embrace a pacifist constitution, is also the only nation ever subjected to the horrors of nuclear bombs in war. We welcome suggestions of sites to plant additional Peace Poles in the Oxford area. Every year in either November of December we hold a dinner to celebrate, build community, and further the work of Oxford Citizens for Peace and Justice. The event features delicious homemade food, live music, and the presentation of our annual Peace and Justice Award, and a Holiday Peace Market. Tickets are $10 for adults; $5 for Students and those on Limited Income; Children 12 and under are FREE. All are welcome. Call 523-6555 or email us for more information.